Every great marriage FACES CHALLENGES ALONG THE WAY. How you navigate the circumstances you encounter with your unique personalities determines the health and success of your relationship. For over four decades Tom and Jan Lane have worked together to build a happy, satisfying marriage, and now they share what they have learned. 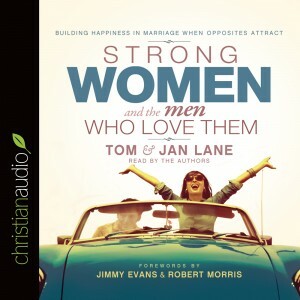 Strong Women and the Men Who Love Them offers practical solutions and enrichment tools for couples with a relational combination of an easygoing husband and an outgoing wife. Using principles and perspectives based in Scripture, couples will learn to appreciate the expression of each person’s gifts to benefit the relationship. To live happily ever after is the desire of every couple, and this powerful marriage resource will help you understand the unique qualities of strong, amazing women and the remarkable men who love them. To live happily ever after is the desire of every couple, and this powerful marriage resource will help you understand the unique qualities of strong, amazing women and the remarkable men who love them.